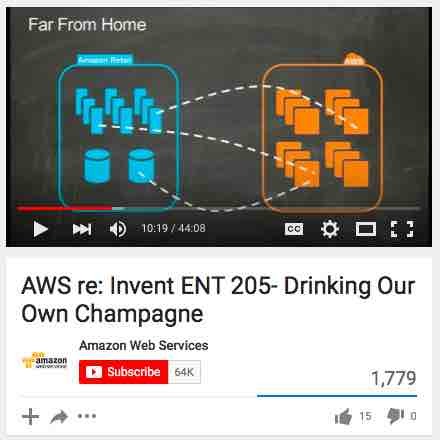 Does Amazon eat it’s own dog food (ahem…) or drink it’s own champagne? I was flipping through the AWS reddit channel and found this excellent presentation from RE:Invent by Laura Grit. She’s in charge of Amazon Retail, and worked very closely with teams on migrating to AWS. She goes in-depth on what that cost in terms of development, what it saved in terms of unused capacity, and surprisingly operational headaches. Laura’s a great speaker. I was surprised to find that Amazon Retails migration was similar to many of the customers I’ve worked with in New York. Often they take a hybrid approach where Direct Connect is key, allowing them to move over in a measured way. What’s more she talks about how EC2 instances have different performance characteristics & applications typically need to be tuned for that world. Around 11:00 in the video she talks about AWS Direct Connect & VPC. These two technologies allow you to leverage AWS as a hybrid cloud, connecting to your existing datacenter. Scale elastically, but migrate in steps. For example Amazon Retail did only webserver fleet in isolation. “Moving the webserver fleet not only got the business excited about the cost savings & our ability to scale linearly, but also got developers excited about the operational load decrease that they had to burden. Flip through to 27:47 and she talks about application changes for the new environment of the cloud. Fast forward over to 37:10 and you’ll hear Laura talk about technical debt. That’s big. “The cloud is not a universal panacea. It can’t coverup for messy engineering practices. Also: Are generalists better at scaling the web?